Punta Cana, located in the Dominican Republic, comprises a little over 1,000 acres of land. Known for its white sandy shores, the region is home to about 100,000 residents and the town of Punta Cana as well. The area lies adjacent to the Atlantic Ocean which is situated to the east. Although the Punta Cana region itself is rather remote, its closeness to major beaches, such as El Cortecito and Bávaro, makes the area a popular Caribbean destination for holiday-goers from the U.S. and UK alike. Punta Cana is typically popular with tourists looking for an all inclusive beach holiday. Tourists can take aquatic tours, visit parks in the area, swim with the dolphins, or visit historical sites, such as the Alcázar de Colón (the former residence of Christopher Columbus' son, Diego, in Santo Domingo). Connoisseurs of art also like to visit theAltos de Chavón, which features the work of area artists and is designed to look like a Mediterranean town from the sixteenth century. Because Punta Cana is in a tropical zone, the weather is warm throughout the year. However, you'll find temperatures a bit warmer from April to November, especially during the summertime. Travellers who like milder temperatures then tend to visit Punta Cana from winter to early spring. Because Punta Cana receives very little precipitation, the time you choose to visit will mainly be based on the temperature or when you can manage to get away. There are plenty of activities to be done in Punta Cana. Many are centred around the beach, with water sports, including surfing, snorkelling, windsurfing and kayaking, extremely popular. On dry land, there are also plenty of options, including horse back riding, hiking and golf. Tourists can also enjoy a meal at one of a number of restaurants, visit local historical sites, or take a boat tour to a nearby island. Needless to say, you simply won't be too hard-pressed to find ways to keep yourself occupied on holiday. You could easily devote a separate holiday guide to Punta Cana's beaches as you have a variety of shores from which you can choose. 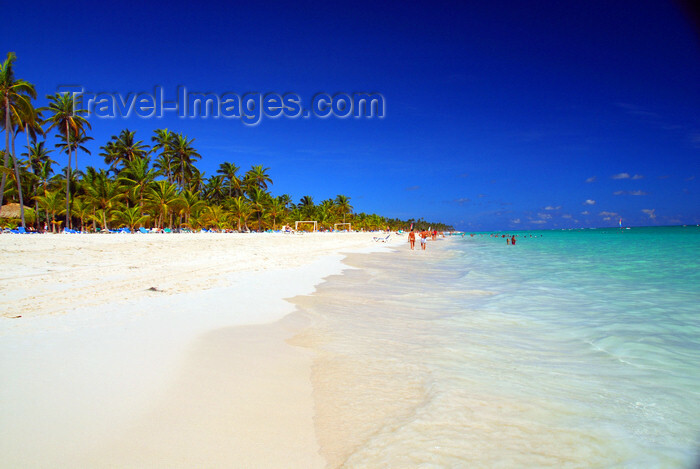 Primary area beaches include Uvera Alto, Arena Gorda, Macao Beach, El Cortecito, and Bávaro Beach in the northern section and Punta Cana, Juanillo, Cabo Engaño, and Cabeza de Toro in the south. All-inclusive resorts dot these beaches, all of which provide guests with the opportunity to enjoy water sports as well as other activities. For equestrians, Playa Cabeza de Toro may be to your liking. The beach sits next to the Natura Park Eco Resort, which provides horseback riding trails for equestrian enthusiasts. Families like visiting the Arena Gorda Beach, whose shallow blue waters make the sandy strip a very kid-friendly shore. The Dominicus Beach has the noted distinction of being one of the Caribbean's cleanest shores. Besides its beaches, Punta Cana also offers holiday-goers plenty in the way of sights and attractions. Day excursions that can be taken from Punta Cana include a short trip to Dolphin Island, where you can swim with the dolphins, or a visit to the water park, the Marnarium (which features snorkelling and other fun water-related activities). A trip that takes longer than a day leads visitors to Rio Yasque, which is notably the lengthiest river in the Caribbean – especially a good spot to try white water rafting. The Punta Cana Ecological Park is also well worth a visit as it is a habitat and home to approximately 80 types of birds and over 500 kinds of flora. Within the park lies the Indigenous Eyes Ecological Park - so named because it features underground freshwater lagoons known as eyes. Take a tour on horseback in the 1,500 acre park. After the sun goes down on Punta Cana, visitors can find plenty of activities to keep them entertained. So, whether you want to relax and enjoy the nightlife atmosphere or dance the night away, you won't be disappointed. One of the newer establishments, Una Mas, provides dancing and drinking and parties. The Areito Discotheque provides club-goers with two halls for all-night dancing. One of the halls caters to those who like salsa or merengue music while the other hall supplies a more varying musical mix. If you want to try your luck at slots, then you won't want to miss the Las Vegas type of excitement at the Casino Diamante Punta Cana Grand (situated about 9 miles from Punta Cana town) or the Dream Casino, which can be found in the newly refurbished Riu Palace Macao. The Hard Rock Hotel and Casino Punta Cana is another good place to go if you want to gamble. All-inclusive resorts provide travellers with luxury accommodations at an affordable price. Grounds feature indigenous flora and fauna in lush, tropical settings – all which are home to coconut palms, flamingos, and peacocks. Most of the accommodations you'll find in Punta Cana fall under the category of all-inclusive resorts. Riu Palace Macao is a popular all inclusive resort located on the beach. Another top-rated all-inclusive resort hotel is the Paradisus Punta Cana, which features 462 rooms. The luxurious, beachfront hotel, which sits on 40 acres of sand, provides guests with spa services. The Ocean Blue Bávarois another favourite accommodation. Located on the eastern coast of Punta Cana, the resort welcomes water sports enthusiasts and golfers alike, and is close to the White Sands Golf Course. The hotel features 374 comfortably fitted rooms. First-class luxury can also be found at the Barcelo Bávaro Beach Resort, which is located close to Punta Cana's airport. Featuring 600 rooms, the resort sits on Bávaro Beach and provides activities 24/7.